Hibs pair Marvin Bartley and Martin Boyle took to Twitter to wind up two of their Hearts opponents in the aftermath of the Easter Road side’s 1-0 derby win last night. 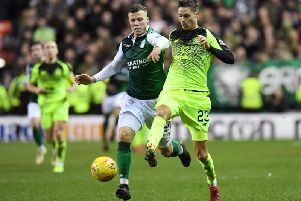 Boyle responded to a tweet from Hearts forward Kyle Lafferty - who had been linked heavily with Hibs in the summer before joining the Jambos - while Bartley took his midfield counterpart Ross Callachan to task. Hibs winger Boyle quoted Lafferty’s tweet post-match simply adding a ‘kiss’ emoji. Boyle’s response has so far garnered 764 retweets and 2500 likes. Callachan meanwhile had said ahead of the game that he was hoping to become a Hearts legend by scoring the winner in the match. The boyhood Jambo told The Sun: “When I was younger I went to the derbies and always thought: ‘I’d love to be on the pitch’. Bartley signed off his tweet with #WeRunThisCity much to the delight of Hibs fans.